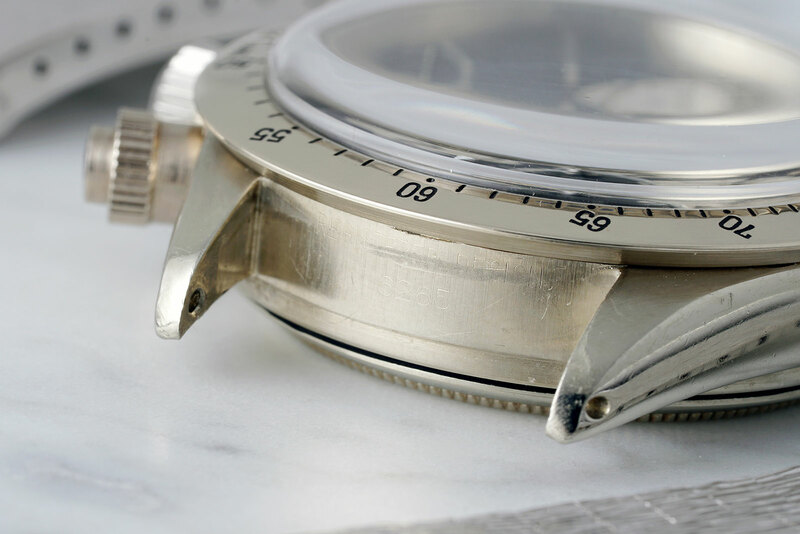 A “unicorn” that is nevertheless well known in the industry, the Rolex Cosmograph Daytona ref. 6265 in 18k white gold is the only one of its kind ever made, and it will be the headline lot in Phillips’ Daytona Ultimatum auction in May 2018. Long the property of the Italian collector and author who goes by the nom de guerre John Goldberger, the white gold Daytona ref. 6265/9 was made in 1970 for a German retailer, and delivered a year later. 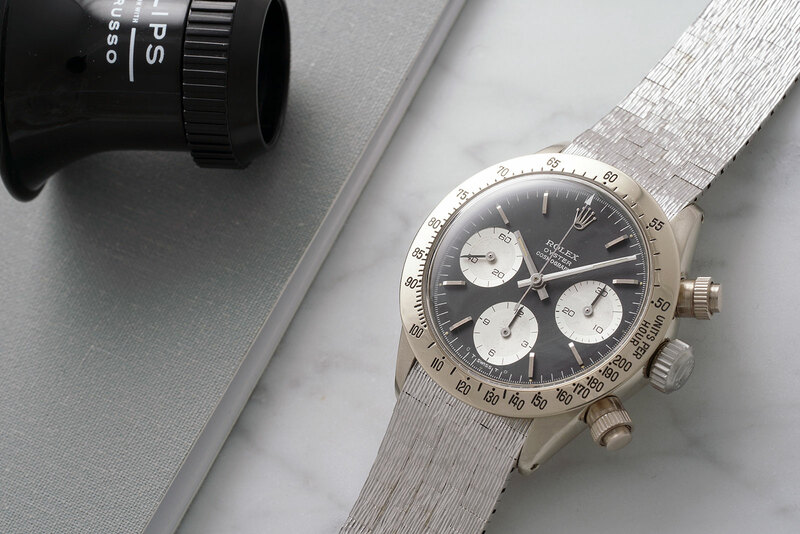 Vintage manual-wind Daytona watches are typically steel or yellow gold (either 14k or 18k), occasionally bestowed with special dials or custom bracelets, making this white gold example significant – and inevitably expensive. 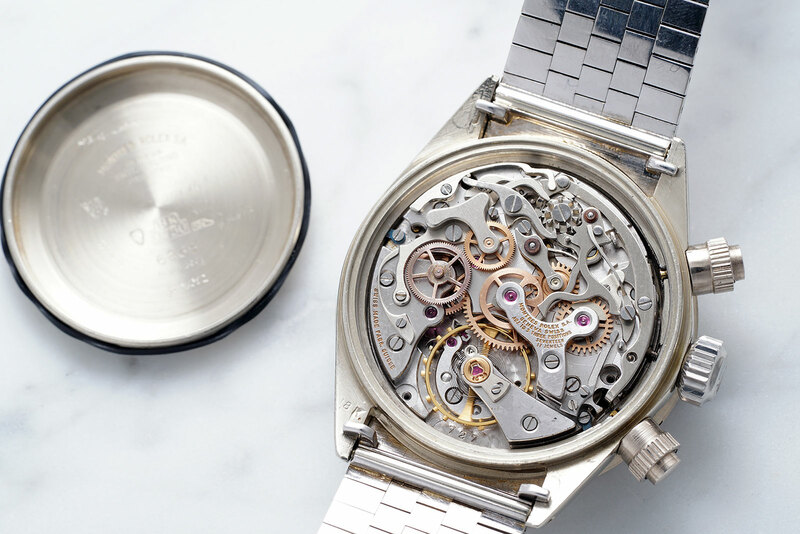 The Daytona is fitted to an period correct, bark finish 18k white gold Rolex bracelet, though it was taken off an Oyster Date, and is not original to the watch. And intriguingly, the crown is steel. Mr Goldberger has generously agreed to donate proceeds from the sale to Children Action, a Geneva-based charity that has benefited from a notable number of unique or special watches sold at auction in the past. In fact, just the day after this Daytona is sold, the one-off, stainless steel Lange 1815 ‘Homage to Walter Lange’ will also be sold by Phillips, again to benefit Children Action, making it a good weekend for the charity. The Daytona in white gold will be sold on May 12, 2018, at Daytona Ultimatum, which takes place at La Reserve in Geneva. The estimate is in excess of SFr3m.